Stabilized Whipped Cream Frosting is every baker’s dream!!! This Easy Stabilized Homemade Whipped Cream recipe made without gelatin will hold its shape for days. 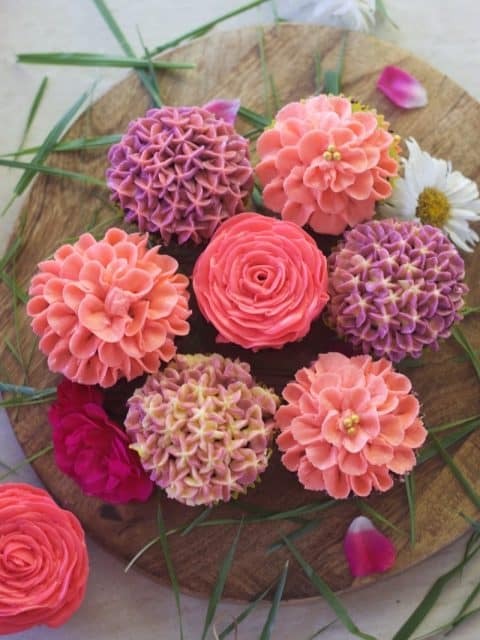 It is a great frosting for your next cake decoration or for beautiful piping or even a delightful topping that’s perfect for cupcakes, pastry or desserts. Stabilized Whipped Cream is something that I had wanted to achieve since a really long time. Off-lately I have started taking cake orders from near and dear ones. Nothing as a full fledged business at this stage just making cakes for close buddies. And it was so happening that; if I allow the cake to stay at room temperature for even just 30 mins I could see that it was not retaining its shape and I had to clean the cake board every now and then to remove the water off. More than that making a birthday cake with whipped cream frosting was becoming a nightmare to me. For the obvious reason of not having enough freedom to decorate it as per my choice or their requirement, as the whipped cream was never stiff enough. Finally, I am ready to bade good-bye to those days because of this “secret ingredient” that has chanded my outlook towards the simple whipped cream recipe making it the best whipped cream recipe ever. For those of you do not know let me first start by sharing; how do you make homemade whipped cream? That’s it these are the two basic ingredients that you need to make this easy whipped cream recipe. You combine the two and whip the cream till you get stiff peaks. You can add any flavouring or colouring agent as per choice. What makes this whipped cream frosting the most sorted one? And why are Asians so crazy about this Stabilized Whipped Cream frosting? 2. So airy, it feels like a cloud in your mouth. 3. 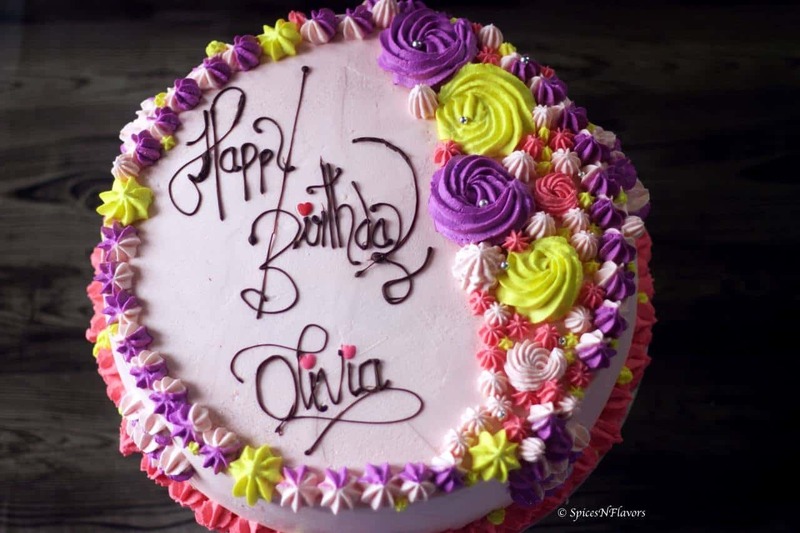 And most importantly, it is not at all sweet, unlike a regular Buttercream recipe which makes it a perfect whipped icing for decorating a cake or cupcake. 4. Easier to work with as it does not call for too many ingredients or steps. 5. Works well with any flavour of choice. 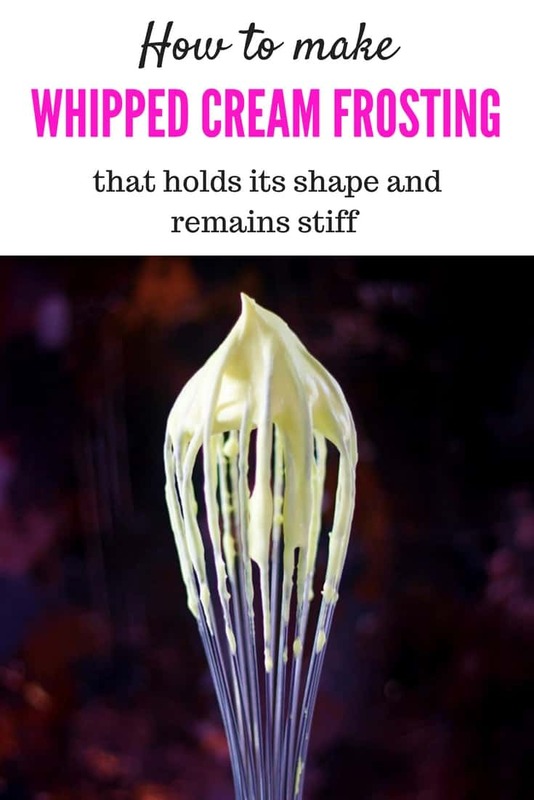 I would not go into the difference between the two products in this Stabilised Whipped Cream frosting post (If you want I can do one separately… let me know in the comments below.) or else it would become way too lengthy and boring for you guys. So the main difference lies in the fat content which makes the dairy whipped cream lose its shape in just a few hours. As the non-dairy ones have stabilizers added to it; it is easier to work with those. Unfortunately, we do not get non-dairy whipping cream so easily here in New Zealand and I am assuming that is the case in most of the western countries. And that is the reason we need a stabilizer to achieve that beautiful shine, glossy effect and the smooth icing on top of our cake. But being a vegetarian I have a very limited choice of selection over the stabilizers that I can use. Ok ok; I get it. I won’t build the suspense even further now… Or else I am sure some of you ladies already have a rolling pin (belan) ready in your hands for hitting me. Yes, adding just a small amount of Cream Cheese to your Whipping Cream makes it the best cream frosting recipe ever. 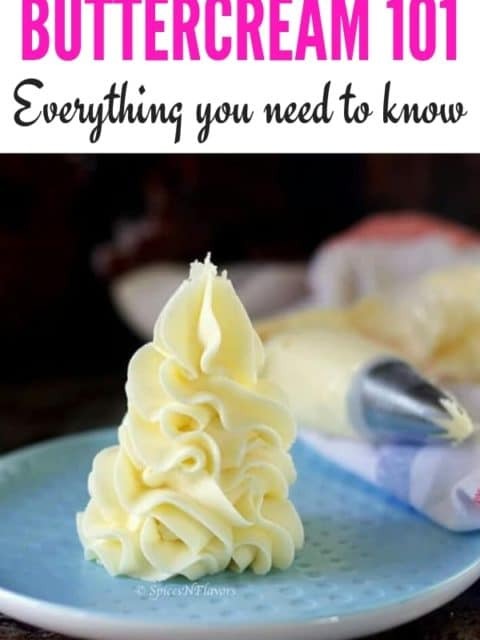 When Pinterest suggested me this pin on my feed, it kind up opened up my inner sleeping brain and I started researching more on stabilized whipped cream which I should have done long back. Anyways I knew it immediately then that I had to give it a shot to stop the many failures that I have seen in my cake decorating experience so far. And when my friend Khushboo tried it too and shared her experience in this blog post of hers I knew that this technique would absolutely work. That confidence that you get and build when you start trusting someone makes you an even better baker. Do you guys trust me? Do I make sense in the posts that I write? Let me know whether you find all these posts informative and you guys really trust and believe in everything that I share with you. More than anything else all I want is to build that trust, that bond between us. Do comment and share your thoughts. Anyways coming back to the Stabilized Whipped Cream frosting post. So I am not sharing the recipe just like that I actually did some comparison between a basic whipped cream recipe and a Stabilized Whipped Cream recipe. You can watch that all in the video. Or here is a short snippet from the video. I did the comparison between the two using these four factors. There might be many other factors too that i did not think off, if you have anything in mind then do share it would be beneficial for everyone. It is no rocket science here. A very evident result is what I achieved. The stabilized whipped cream frosting looked way too smoother, glossier, shinier just like the consistency of a spreadable butter without any lumps and bits as compared to the basic whipped cream. Nothing can beat the light and airy texture of a freshly whipped cream. So in terms of lightness, I will have to give it to the plain whipped cream. But, wait for it, once you taste the Stabilized Whipped Cream I can guarantee that you would never go back to the plain ones. I know you might be having this question in your mind; won’t I taste the cream cheese if I am using it? Absolutely NOT!!! feels good to learn this right!!! That is because the amount of cream cheese you use as compared to the whipping cream is actually so less and once you add the flavouring agent then there is no after-taste of cream cheese. Cream Cheese just helps us stabilizing the entire whipped cream. Again a no-brainer there right. If your frosting is smooth and whipped to the right consistency then there is nothing like a cake with whipped cream frosting. And the bonus point is that this Stabilized Whipped Cream will hold its shape for days together. A nice stiff and smooth piping is what every baker wants right!!! Now that’s the whole point of this post. What we are trying to achieve is a whipped cream frosting for birthday cake or be it any cake for that matter that is smooth and stable given any time or temperature of the day. I have often heard many people complain about their whipped cream cake falling apart in the hot and humid climate or the frosting melting down pretty quick. If you are someone who have experienced this then look no further, have faith in me and try out this particular version of Stabilize Whipped Cream and you will be amazed at the outcome. This frosting remains stable and holds its shape for days together. Even after 4 days, the frosting remained smooth and pipeable. You can check the video yourself. A quick disclaimer here: It would definitely melt if you let it sit in hot weather for a really long time. Otherwise pretty easy and convenient to work with. This Easy Homemade Stabilized Whipped Cream recipe made without gelatin will hold its shape for days. It is a great frosting for your next cake decoration or for beautiful piping or even a delightful topping that’s perfect for cupcakes, pastry or desserts. Whip the softened cream cheese until lump-free and smooth. Scrape the bowl in between if needed. Once the cream is added; add the icing sugar. Remember to whip the cream continuously while adding sugar. Now that even the sugar is added; add your desired flavouring and colour and whip until stiff peaks. Your cream and delicious whipped cream frosting is now ready. How do I know my whipped cream is whipped to stiff peaks? 1. 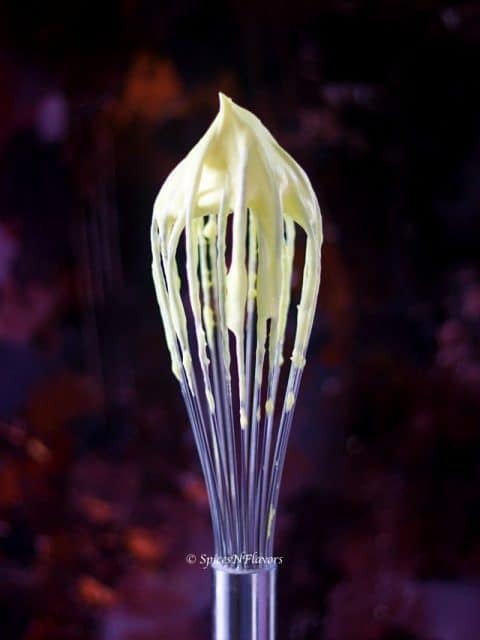 When you lift the cream with the help of your whisk; the cream would stand out like a peak with a sharp point and it would not lean over to one side. How do I avoid my cream from being over-whipped? Well, you have to take care of this part really well because once the cream is over-whipped there is no way to bring it back. However, sharing with you all a small step that I follow to avoid this. Once my cream reaches soft peaks stage I stop whipping it using my hand blender and switch over to manual whisking using a wire whisk. That is because when you whip it manually you have a better control over the cream whereas the beater whips it a faster rate making it a little bit difficult to stop at the right stage… This is just for beginners. 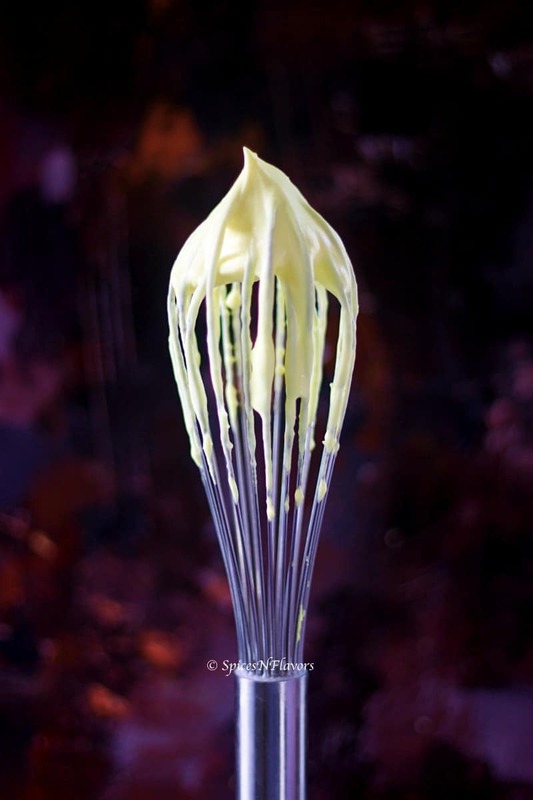 If you are comfortable using a hand blender then definitely go ahead and whip your cream to the right stage. What is softened Cream Cheese? By softened cream cheese all I mean is a cream cheese that has been resting at room temperature 30 mins prior to whipping. It is difficult to whip the cream cheese straight from the fridge. You want it to be soft and not melted. If you are running out of time, definitely you can choose to microwave it for 10-20 seconds before starting your whipped cream frosting. Can I use regular powdered sugar in place of icing sugar? Hmmm… so the thing is icing sugar has cornstarch added to it which also helps in stabilizing the cream so I would highly recommend using only icing sugar here. Is there any additional instructions that I must take care off? Simply whip your cream cheese until it is smooth and lump-free rest of the steps will automatically fall into place. 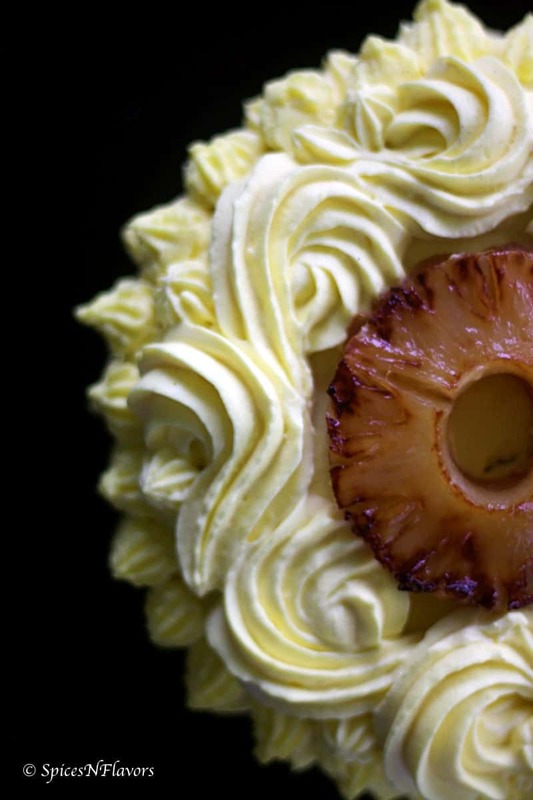 By the way, I used this Best Whipped Cream recipe to make and decorate a 7 inch Pineapple Cake the recipe for which you can expect in my next post. If you like my today’s post on Stabilized Whipped Cream and found it informative then do let me know by tagging me, tweeting me or Instagram me. I would love to follow you and your posts. And if you are a beginner and love cakes that call for whipped cream frosting then definitely check out my chocolate cake with whipped cream frosting recipe actually with chocolate whipped cream frosting. The chocolate cake is so easy to make just like counting 1 2 3 and the messy frosting makes it perfect for any beginner reading this. 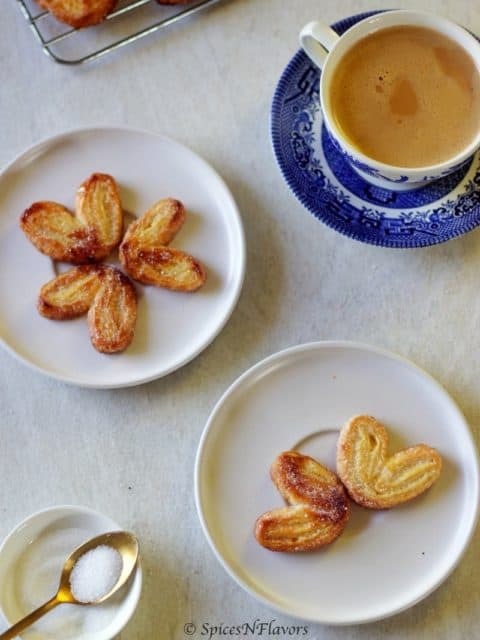 In fact, feel free to follow my beginners baking board on Pinterest and you will be impressed how easy it is to start baking. Thank you Sushma for this educative write-up and accompanying youtube video. 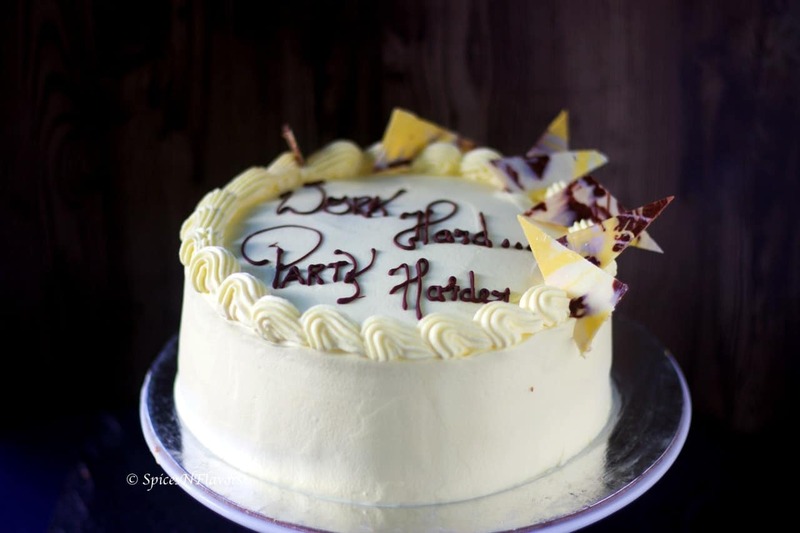 I am a beginner in the world of decorations in baking and by going through your posts I have a feeling I will learn the correct fundamentals of decorative baking. We all start from somewhere right.. I were a beginner too 2 years ago, learned a lot in my cake decorating journey. Whether it is dairy or non dairy whipping cream for the recipe ? Pl confirm. The one that I have used is dairy whipping cream. But you can follow the same procedure for non-dairy whipping cream as well. But I believe that non-dairy whipping cream already has some sweetness to it so maybe you will have to reduce the amount of sugar in it. Hi I tried this method and got amazing result.thanks for the tips!! Not able to share my cake pic here. Would love to show up the stiff peak achieved. If I wanted to make this a day in advance of assembling my cake, would I make this recipe per your instructions and refrigerate it? Sorry if this seems like a obvious question. No question is obvious.. we all learn something or the other each day.. I am so glad to read your comment. So good to know that you found this recipe informative and worthy enough to try. I wish you all the very luck to bake that perfect cake for your little one. Do share your wonderful feedback with us if you happen to try. I thank you for sharing. I stay in Zambia and the town where am based the stores only stock medium fat cream cheese. Can I use it for this recipe. I think it should work fine.. do try it out and let me know how it turned out to be..